Metalitalia.com, Eagle Booking Live Promotion, and Vertigo are proud to finally present you the program for this year’s Metalitalia.com Festival. Once again the main event will take place over two days: on Saturday, September 15 and Sunday, September 16. For the first time in our history, a warm-up party has also been scheduled. The pre-festival show will take place on Friday, September 14! The first day of the main event will be fully dedicated to classic and power metal in all its shades and glory. The bill will be topped by Swedish power metal heroes HAMMERFALL, now celebrating their 25th year of existence, along with German power metal institution RAGE. Earlier in the evening, frontman Peavy Wagner will also be joined by longtime friends Chris Efthimiadis and Manni Schmidt under the banner REFUGE to perform tracks from RAGE’s early years along with new hits from their anticipated debut album “Solitary Men”. Furthermore, we are delighted to be able to confirm Germany’s highlanders GRAVE DIGGER: these long-running metallers will be performing a very special set based on their now legendary “Middle Ages Trilogy”, which includes masterpieces such as “Tunes Of War”, “Knights Of The Cross” and “Excalibur”. The lineup is wrapped up by Italy’s epic metal leaders DOMINE, along with folk metal institution ELVENKING, defiant power-progressive metallers ELDRITCH, cult epic power metal band ROSAE CRUCIS and speed metal newcomers ASGARD! After orchestrating glory and gloom across festivals and venues all over Europe and beyond, doom metal masters CANDLEMASS will headline the event’s second day. The band is working on a new album and have just released a new EP aptly entitled “House Of Doom”. 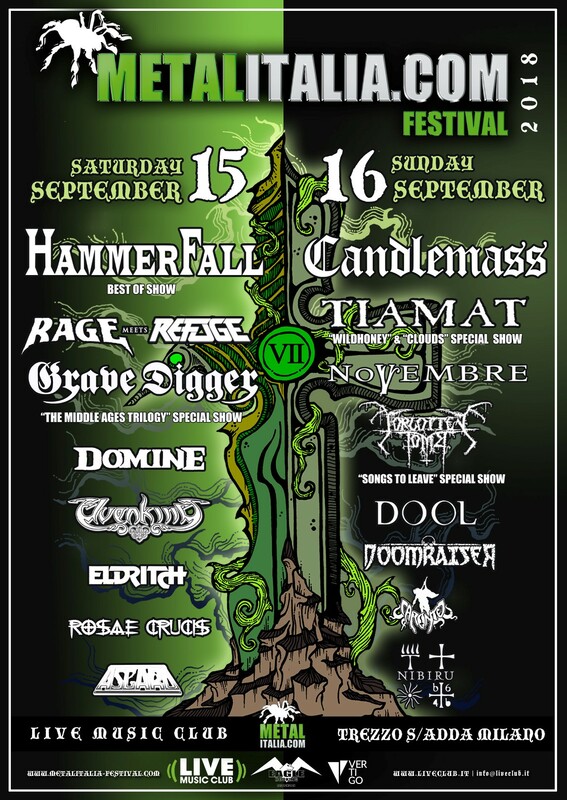 CANDLEMASS will be joined by fellow countrymen TIAMAT. Johan Edlund and his friends haven’t visited Italy in a while and for the occasion, they will be performing a very special set covering their masterpieces “Clouds” and “Wildhoney” in full! Italian melodic death-doom metal institution, NOVEMBRE also join the eclectic cast, along with infamous doom/depressive black metal commando FORGOTTEN TOMB, who will be performing their highly influential debut album “Songs To Leave” in full! Up and coming doom rockers DOOL will fly the flag for the Netherlands, while Rome’s classic doom metallers DOOMRAISER, cursed stoner rockers CARONTE and occult sludge-doom metallers NIBIRU complete an Italian underground invasion. Live Music Club (www.liveclub.it) with its advanced technical equipment is one of the most important and renowned venues in Europe for indoor events. Awarded in 2012 as the best Italian music club, the location offers also free parking, connections with Milan’s public transports and a big outdoor area where you’ll find stalls, merchandise, CDs, meet & greet, lounge, food, and bar. Moreover, at the first floor, the Live Club Restaurant with its 100 seats is the best place to eat with an exclusive view of the stage.